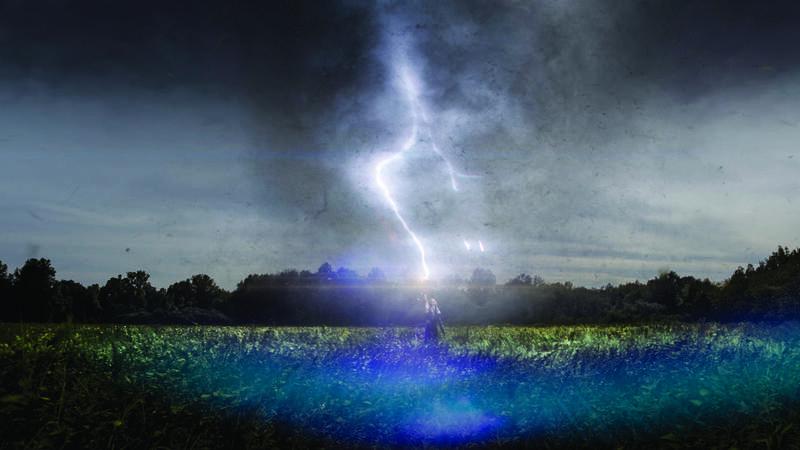 As today, May 4th, has arrived, here is the final day of AVENGERS WEEK on the site. I hope that you have enjoyed this fantastic look at the films and the characters that all lead up to the movie that we have been waiting for, oh, so long! 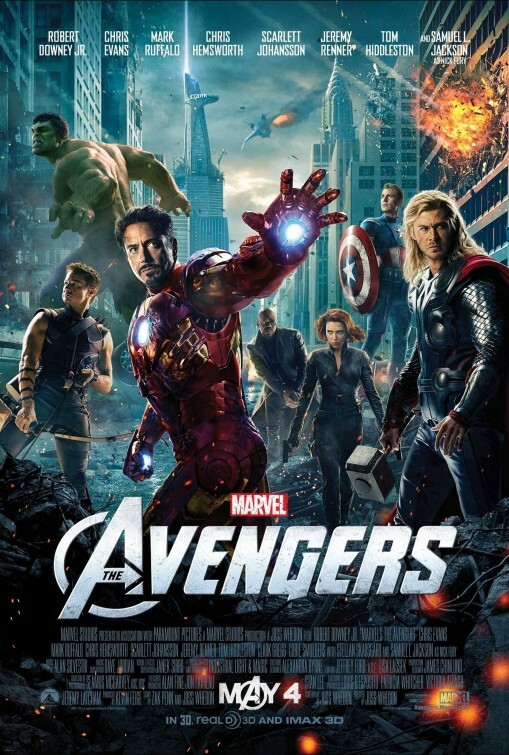 As promised, here is my contribution to AVENGERS WEEK: Post #10, Review of Marvel’s greatest movie to date, The Avengers. Starring: Robert Downey, Jr., Chris Evans, Samuel L. Jackson, Scarlett Johansson, Mark Ruffalo, Chris Hemsworth, Tom Hiddleston, and many more! It’s finally here! 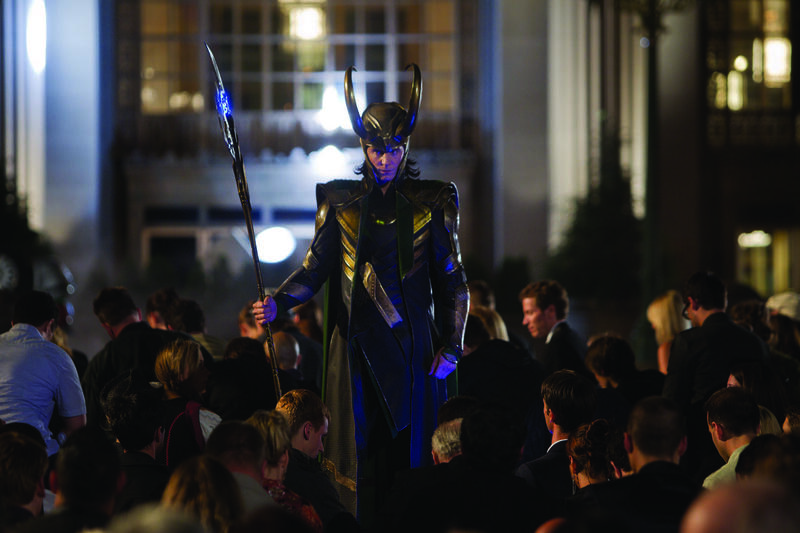 The movie we’ve been highlighting this entire week here on AVENGERS WEEK. It is now time for you all to assemble for the greatest Marvel movie to date and watch some of “Earth’s mightiest heroes” defend and avenge our planet. Picture courtesy Time-WellSpent. Click the picture to see more pictures taken by Jaina of the UK premiere of the film! So many people, critics, and fans have expressed both excitement and speculation when it comes to the capability of director Joss Whedon and the cast of this film (naysayers of Mark Ruffalo’s addition as The Hulk, complaints heard of too many high-profile characters, etc). Well, let’s just say that they can all sit in a theater and stop complaining now, because Whedon and cast nailed it! !…with Thor’s hammer! ha! Full of action, Joss Whedon appropriately finds the right balance of events, characters, focuses, and plots and delivers one of the best superhero movies ever. Appropriately giving each and every character in the film enough time on the screen to keep an engagement with and attachment to their respective story, every character in the film has the right amount of story told without distracting from the mission at hand. If ever there was a way to show how so many superheroes come together, have to work out their differences among themselves, and then are forced to come together as a team, THIS is the way to do it! (D.C., you better be taking notes if you expect to have a rival Justice League movie…I’m just saying). 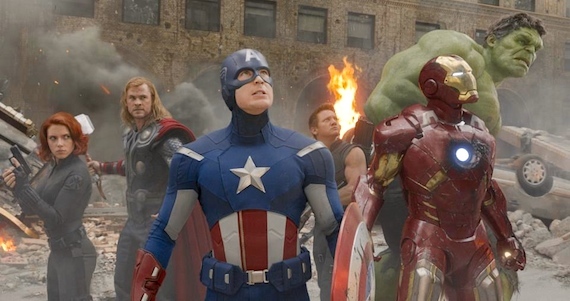 With believable foes, extraordinary character development, epic battle scenes, and very little of it actually spoiled by trailers, The Avengers shares an ultra-impressive look at what superhero films should be made of. The length of this movie (approx 2.5 hrs) is perfect in order to tell this amazing story. (It is advised that you watch each of the films leading up to it first to understand more of what is going on.) It’s one big giant adventure with the same characters (and new ones) we have come to love from the “prequel” films. From Downey, Jr.’s Iron Man to Tom Hiddleston’s Loki and more, each character is given plenty of time to shine and shine they do. Thor’s fight scenes; Hawkeye; Black Widow’s much more important role in the film (as opposed to her role in Iron Man 2); The Hulk; Iron Man’s wit and conflicts with Captain America; the fighting sequences…ALL of them; seeing how all of the previous films worked right into this one; the humor and amount of laughs that are incorporated and not forced into the film; The Helicarrier! Oh man, so much to geek out about in this movie! I will just simply tell you this: With a strong cast, strong following, impressive story, amazing special effects, and more, The Avengers rocks. It is a must-see. Even some of the moments in the post-converted 3D are pretty neat. Whedon just naturally includes so many of the elements of this film into one big awesome delivery that none of it seems forced or unnatural, and it easily flows into the movie we’ve been wanting and deserving to see. 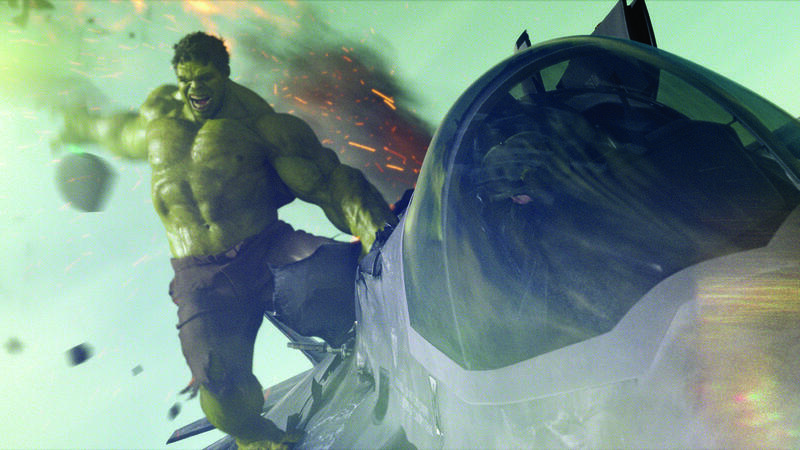 There is nothing to NOT like about The Avengers! Some of you will remember that I went to a casting call over a year ago for The Avengers. Well, I also was fortunate to be picked. After filming for several weeks and waiting for the movie for MONTHS after that, last night I attended a special premiere event for The Avengers where I, along with several others who spent time filming on the set with the cast and crew of the movie for several weeks, were the guests of honor at a theater in Albuquerque, NM. While I was unable to get a video of everyone together sharing their thoughts on the movie, I thought I’d at least share with you a photo of us at the festivities as we watched and celebrated our hard work on the set of the film. 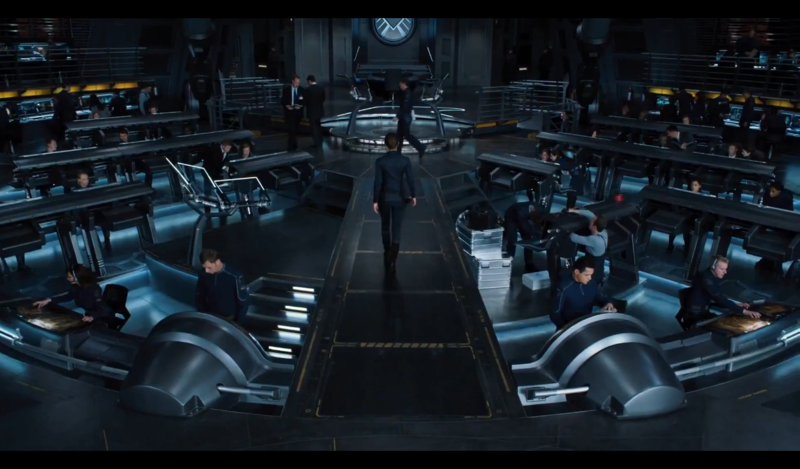 If you look carefully throughout the film, you can see several of my friends and I in different scenes on the helicarrier in the film! It was a fantastic experience that I will never forget and that I will always cherish. S.H.I.E.L.D. Agent for LIFE! 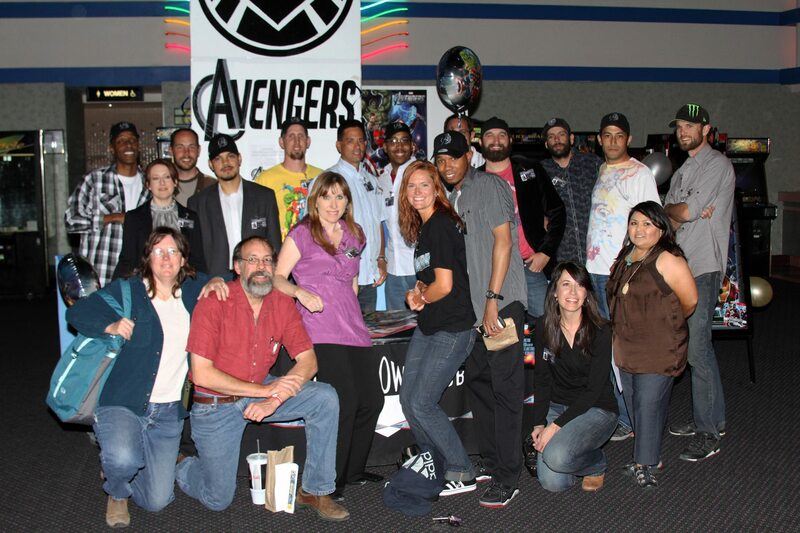 Several of us “extras” at the special midnight premiere hosted in Albq> I am in the very back row, 5th from the left, with glasses, white shirt, and black AVENGERS hat on. See if you can spot me in the movie! Thanks sir! so very much! really enjoyed this film! Thanks Julian. I hope you enjoy it with your dad! Super nice of Ruth. She’s awesome like that! This wound up being every bit as great as I had hoped it would be. Sure, there are some things I would have loved to have seen that weren’t in there (Cap being worthy to lift Mjolnir would have been awesome to see), but I can’t complain one iota about what was there. This just blew me away with how good it was. You were in the Avengers movie? extra? S.H.I.E.L.D agent? that is amazing, that must have been amazing! God, I’d love to do that one day, even if it was just as an extra- to see all the production, the actors, the whole process! Like guy, I’m happy for you! Thank u very much. It really was a fantastic experience and I loved every minute of it. But, even more amazing is how great the movie turned out! Woohoo! 5 out of 5 is right buddy. I’m glad Ruffalo signed his deal, he was incredible. As was everything else in this movie. “Pure awesomeness across the boards!” Right on, Fogs! So glad that you enjoyed the film, though! woohoo! I may just break my record of 6 trips to the theater for 1 movie with this one. Heh. I cant imagine going to the same flick now 6 times – I did that when I was younger, I saw T2 like 11 times… but I’m too busy with new stuff nowadays. It’d be brutal. We gotta get you into a movie here soon! I wasn’t able to find you in the movie! Danielle and I were disappointed that we couldn’t spot you lol. The Thanos credits clip was amazing. That was something I never expected. It also was kind of rewarding in a weird way that only my brother and I were freaking out in the theater because we were the only ones there who knew who that was haha. The movie was fantastic. I’m jealous that you got to be apart of it! I wish I had known how to get on that haha. Great review T. Take care! i would much rather you enjoy the movie than try to find me! Save that for the 3rd time you watch! 🙂 but thanks for looking for me. Perhaps we can go together soon. So glad you loved the movie! So did I…obviously! Yes, yes and yes. 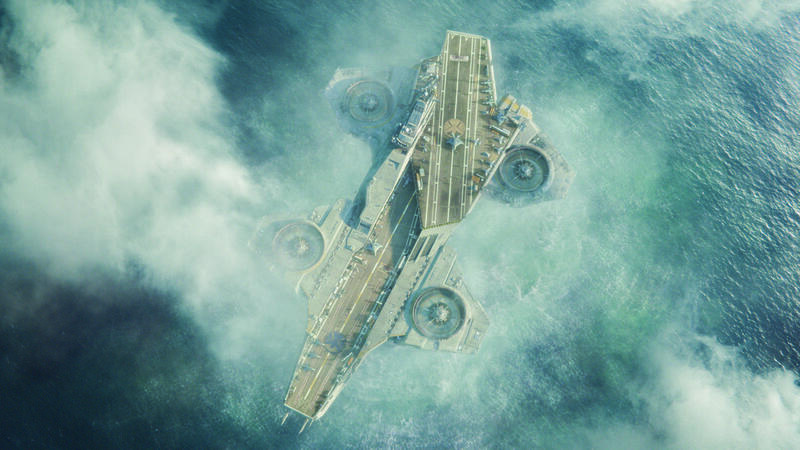 The helicarrier scene just sends shivers down my spine – it is so beautifully done. That track on the score is probably my favourite. Such a great film. Glad to see it getting some great reviews across the board. It’s currently #25 on IMDB’s top 250! You’re famous! 😀 I’ll have to see it again and try to spot you. Great movie and great review! Thanks Dustin! I was glad to make the cut! I’m glad that you enjoyed the movie too! I LOVED it. Still don’t know what the hell everyone’s raved about. I’d give this a 3/5. Yes, I did! Thanks for expressing your interest!